Ugo Rondinone, Installation view, Clouds + Mountains + Waterfalls, Sadie Coles HQ. Copyright the artist, courtesy Sadie Coles HQ, London. 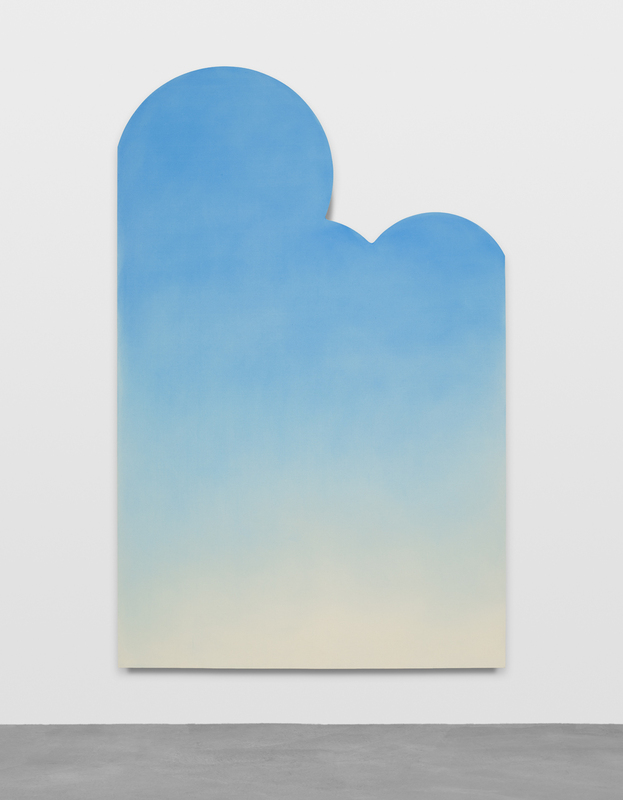 Ugo Rondinone’s autumn exhibition at Sadie Coles HQ, Clouds + Mountains + Waterfalls, comprises three new bodies of work. 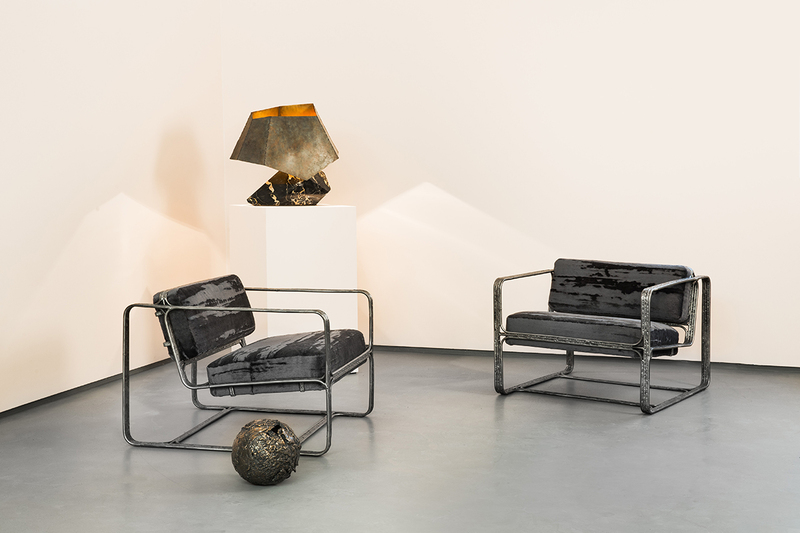 Each extends the artist’s long-running interest in natural phenomena and their reformulation in art. 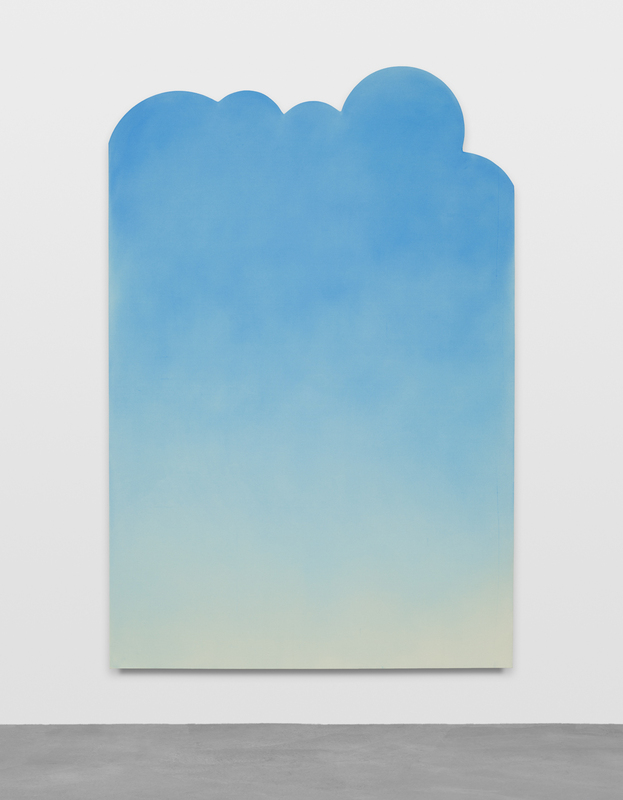 Cloud paintings are large canvases painted in fine gradations of sky blue. Their rectangular fields transform into cloud-like undulations at their upper perimeters, creating a sharp contrast between the vaporous trompe l’oeil image within each painting and the jigsaw-style silhouette of the canvas itself. 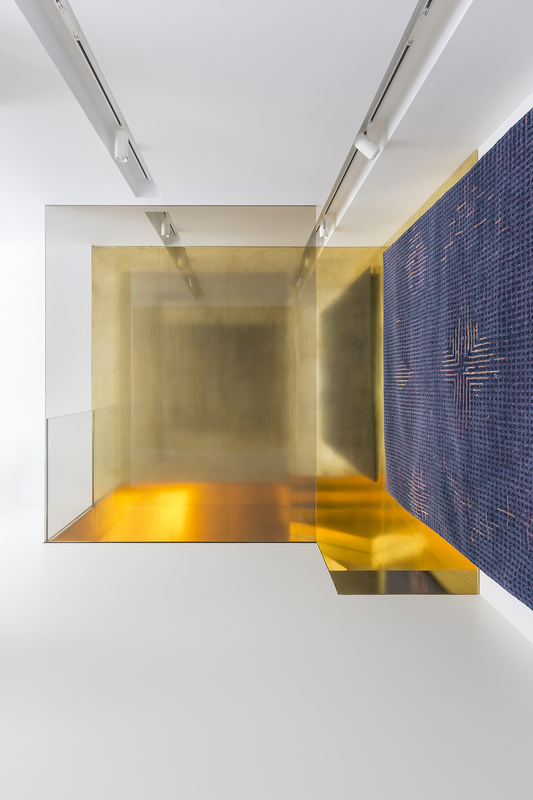 These works depict immeasurable space while also exuding a contrary sense of finiteness: the borders of the canvas arrest the illusion of infinity, while the title of each refers to the precise date of its creation. 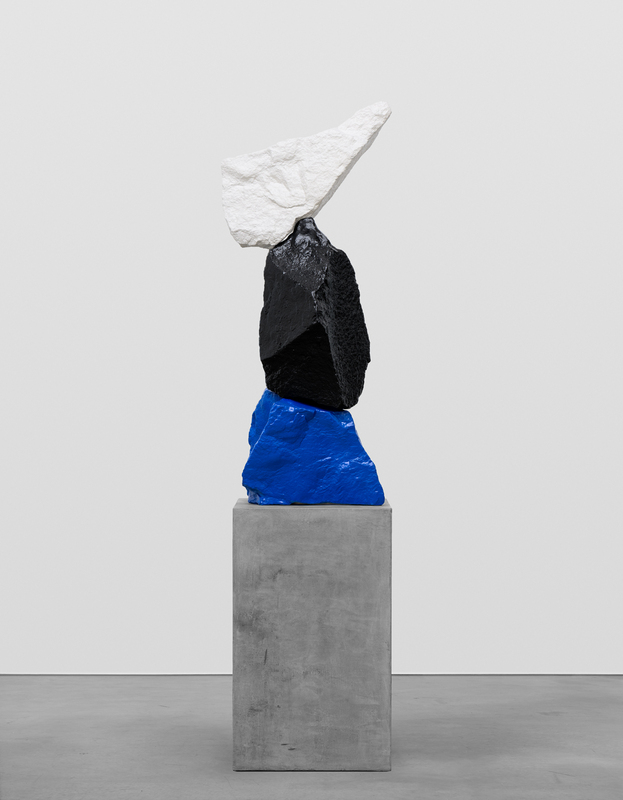 Mediating between geological formations and abstract compositions, Rondinone’s new Mountain sculptures consist of rocks stacked vertically on concrete plinths in groups ranging between two and six. Inspired by naturally-occurring Hoodoos (spires or pyramids of rock) and balancing rock formations, the stacks also evoke the art of meditative rock balancing. Waterfall sculptures form the third new series – thin, freestanding lines modelled by hand in clay and cast in aluminium, whose spiralling forms evoke jets of water. Like the Mountain sculptures, these vertical forms succeed in appearing simultaneously weightless and earthbound, graceful and awkward. Delicately balanced on the floor, they seem both to cascade downwards and unfurl upwards in the manner of an Indian rope trick, yet their mottled surfaces – indented with fingerprints and ridges – profess their rigidity and artifice. Rondinone’s paintings and sculptures have frequently referred to primordial phenomena – air, moons, the sun, the cosmos – in their titles or forms. 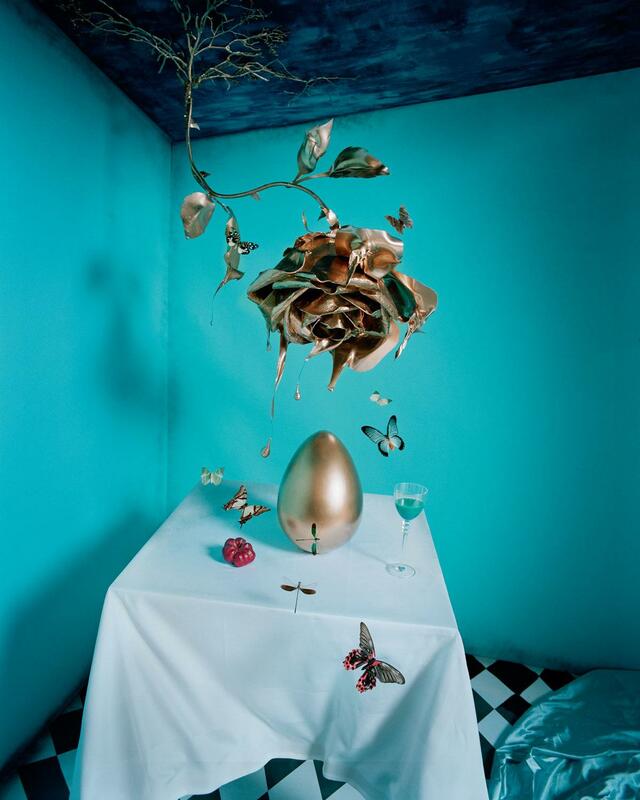 Referring concurrently to the natural world, romanticism and existentialism, his latest works encapsulate a “mental trinity” that has underpinned his art for more than twenty years. 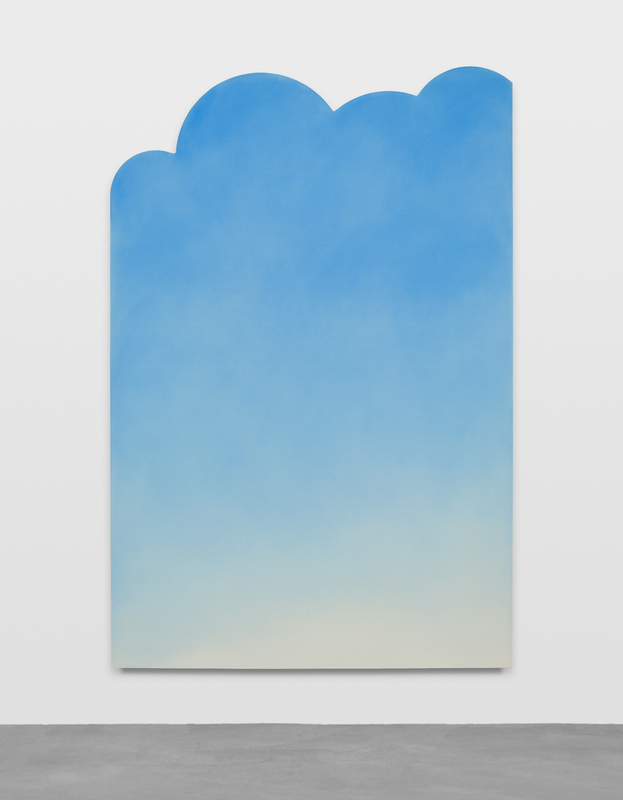 //La mostra autunnale di Ugo Rondinone esposta alla Sadie Coles HQ di Londra, Clouds + Mountains + Waterfalls (Nuvole + Montagne + Cascate), include tre nuovi nuclei di lavori, ognuno dei quali porta avanti l’interesse di lunga durata dell’artista per i fenomeni naturali e le loro riformulazioni in ambito artistico. I dipinti della serie Cloud sono costituiti da grandi tele, dipinte in sottili gradazioni di blu. Le loro aree rettangolari si trasformano in ondulazioni a forma di nuvola nella parte perimetrale superiore, creando un contrasto netto tra la vaporosa immagine trompe l’oeil all’interno di ogni dipinto e la silhouette seghettata della tela stessa. Questi lavori raffigurano lo spazio incommensurabile ma al tempo stesso emanano un senso opposto di limitatezza: i bordi della tela bloccano l’illusione di infinito, mentre il titolo di ogni opera richiama la data precisa della sua creazione. Interponendosi tra le formazioni geologiche e le composizioni astratte, le Mountains di Rondinone consistono in rocce impilate verticalmente su basamenti in cemento in gruppi che oscillano tra 2 e 6. Ispirate alle formazioni rocciose naturali Hoodoo (camini delle fate o piramidi di terra), le pile evocano anche l’arte meditativa delle pietre in equilibrio. Le sculture Waterfalls della terza nuova serie sono sottili linee autoportanti modellate a mano in argilla e realizzate in alluminio pressofuso, la cui forma turbinosa evoca gli zampilli d’acqua. Come per le sculture Mountains, queste forme verticali riescono ad apparire allo stesso tempo senza forza di gravità e piantate a terra, leggiadre e sgraziate. Finemente bilanciate sul pavimento, sembrano sia ricadere verso il basso che spiegarsi verso l’alto alla maniera del trucco indiano della corda, anche se la loro superficie a chiazze – intaccata con impronte digitali e creste – manifestano la loro rigidità e artificio. Le sculture e i dipinti di Rondinone di frequente rimandano a fenomeni primordiali – aria, satelliti, sole, il cosmo – nei titoli e nelle forme. Rinviando simultaneamente al mondo naturale, romanticismo ed esistenzialismo, i suoi ultimi lavori condensano una “trinità mentale” che ha sostenuto la sua arte per più di vent’anni. 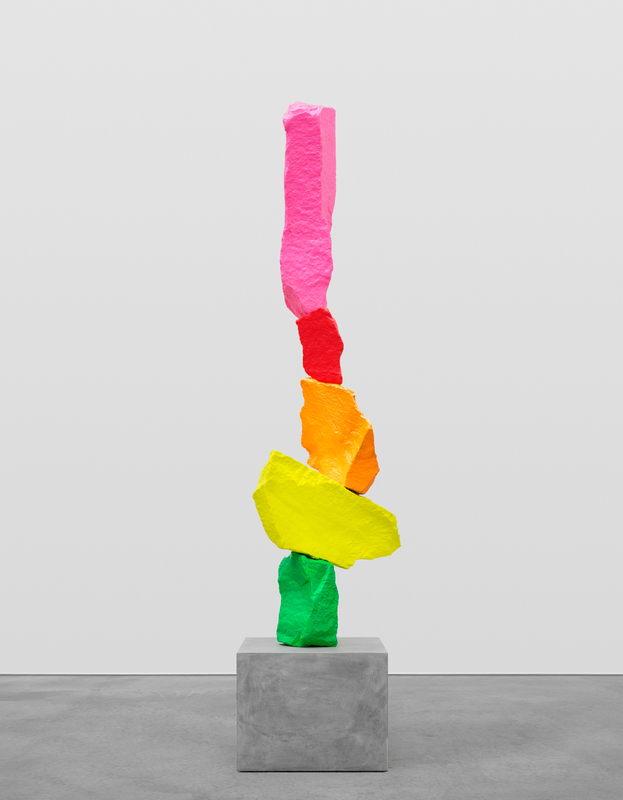 Ugo Rondinone, Green yellow orange red pink mountain, 2015. Copyright the artist, courtesy Sadie Coles HQ, London. 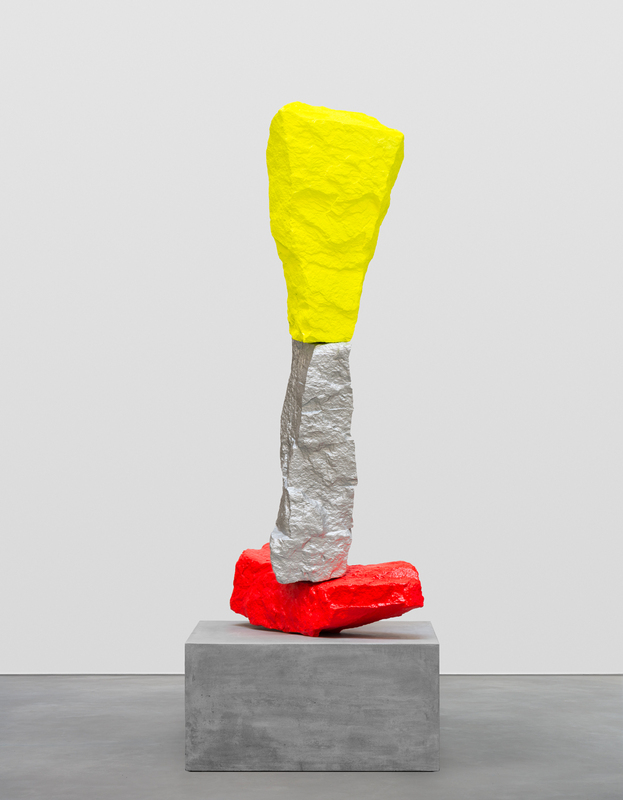 Ugo Rondinone, Red silver yellow mountain, 2015. Copyright the artist, courtesy Sadie Coles HQ, London. 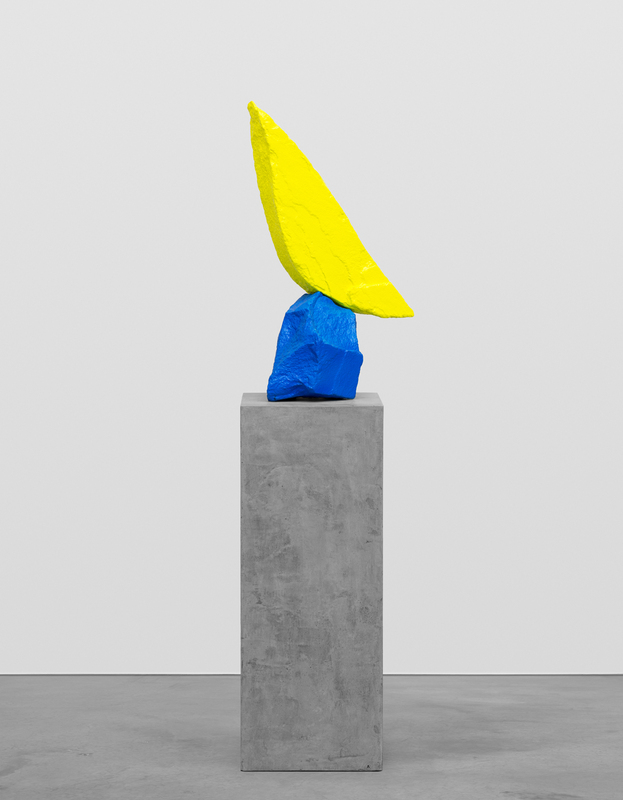 Ugo Rondinone, Blue yellow mountain, 2015. Copyright the artist, courtesy Sadie Coles HQ, London. Ugo Rondinone, Blue black white mountain, 2015. Copyright the artist, courtesy Sadie Coles HQ, London. 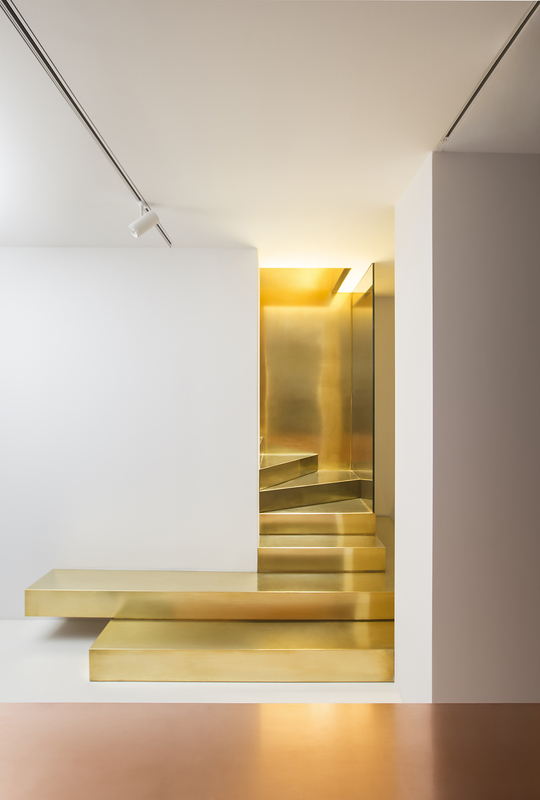 Installation view, Ugo Rondinone, Waterfalls, Sadie Coles HQ. Copyright the artist, courtesy Sadie Coles HQ, London. Ugo Rondinone, Olo’upena falls, 2015. Copyright the artist, courtesy Sadie Coles HQ, London. 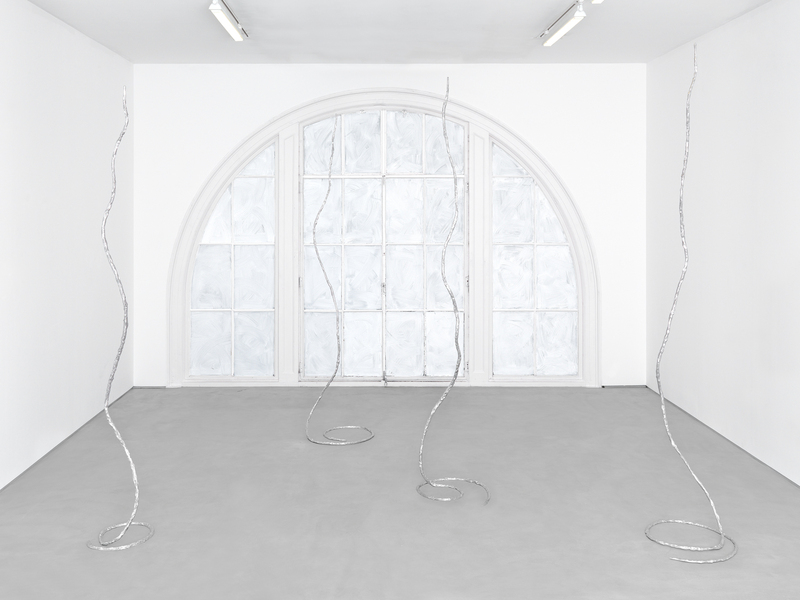 Ugo Rondinone, zwanzigsterjunizweitausendundfünfzehn, 2015. Copyright the artist, courtesy Sadie Coles HQ, London. 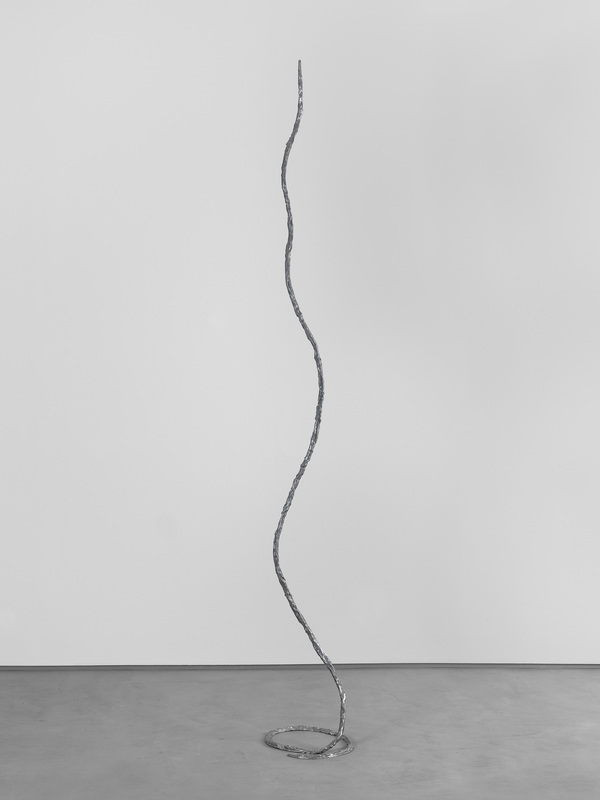 Ugo Rondinone, vierundzwanzigsterjunizweitausendundfünfzehn, 2015. Copyright the artist, courtesy Sadie Coles HQ, London. 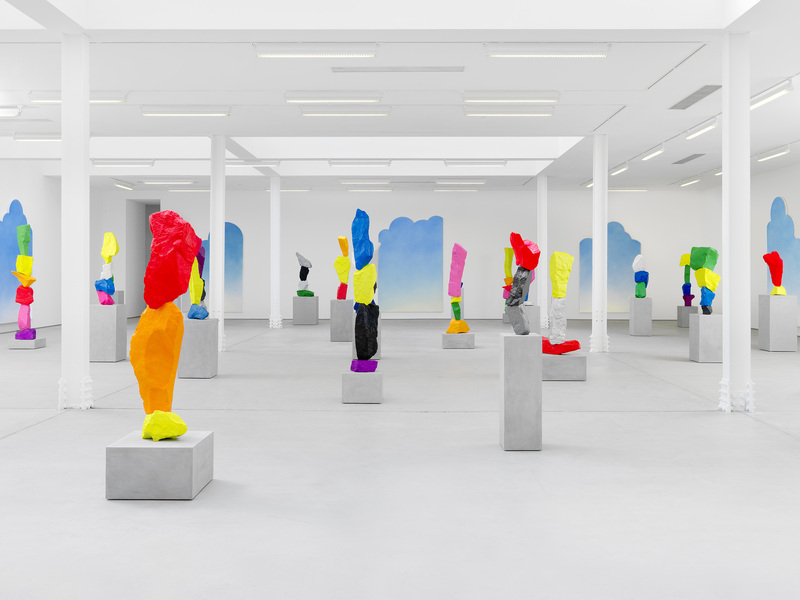 Ugo Rondinone, sechsundzwanzigsterjunizweitausendundfünfzehn, 2015. Copyright the artist, courtesy Sadie Coles HQ, London. 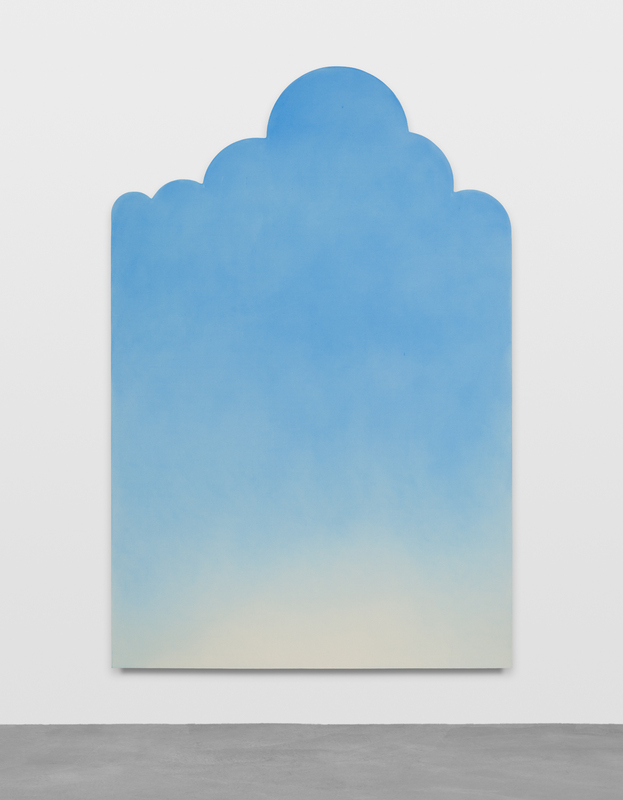 Ugo Rondinone, neunundzwanzigsterjunizweitausendundfünfzehn, 2015. Copyright the artist, courtesy Sadie Coles HQ, London. For further infos please refer to the gallery website.